Drovers, bringing their herds up from Texas, don't like Opportunity, Kansas, at all. The town is full of crooks and corrupt officials, milking the cattlemen for all they're worth. 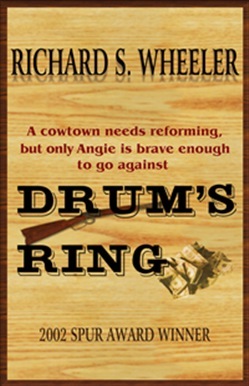 Angie Drum, the editor of the town's weekly paper, is determined to root out the corruption and give the cattlemen from Texas a fair shake. But when she starts looking into the corruption, she is shocked to her core. Opportunity is not a friendly town any more; not for visiting Texans, and not for herself. This novel won a Spur Award from Western Writers of America. Acquista Drum's Ring in Epub: dopo aver letto l’ebook Drum's Ring di Richard S. Wheeler ti invitiamo a lasciarci una Recensione qui sotto: sarà utile agli utenti che non abbiano ancora letto questo libro e che vogliano avere delle opinioni altrui. L’opinione su di un libro è molto soggettiva e per questo leggere eventuali recensioni negative non ci dovrà frenare dall’acquisto, anzi dovrà spingerci ad acquistare il libro in fretta per poter dire la nostra ed eventualmente smentire quanto commentato da altri, contribuendo ad arricchire più possibile i commenti e dare sempre più spunti di confronto al pubblico online.